Two weeks and one day ago, Martina arrived from Milano, Italy, to live with me until the end of the school year. We have discovered astonishing similarities: we both sing and play the piano, we love vegetables and fish, we read books. Tonight my grandson and daughter are coming over for Italian food. We went grocery shopping today, bought pancetta for pasta alla carbonara. Because my grandson is vegetarian, we purchased Morning Star “bacon” and will make a separate vegetarian version for him. As we planned this repast, I learned that in Italy everyone eats several courses unless in a very big hurry. Course one includes various little goodies like cheeses, nuts, salami, often thought of in the US as antipasto, but it can include many other things. Each person obtains a drink of his or her choice and snacks on the goodies and converses. There are separate courses that follow: pasta, meat or fish, salad, and finally dessert. Italians eat dinner late, e.g. 9-9:30, which reminded me of Argentina where people also eat late. I like to eat late unlike many people in the US. However, we won’t eat that late tonight, more like perhaps 7:30 or whenever we get everything done. Right now as we await the arrival of my family, Martina and I are sipping tea while she works on a dystopian short story she has to write for English class–she is a senior here–and I write this blog post. The snow from last evening has mostly melted and the sun is setting. Martina loves Panhandle of Texas sunsets and sunrises. I will take photos of the food and post them tomorrow. Six years ago my first exchange student, Kornpanod (Mink), from Thailand, joined my life. Recently, she came to visit me for a month. 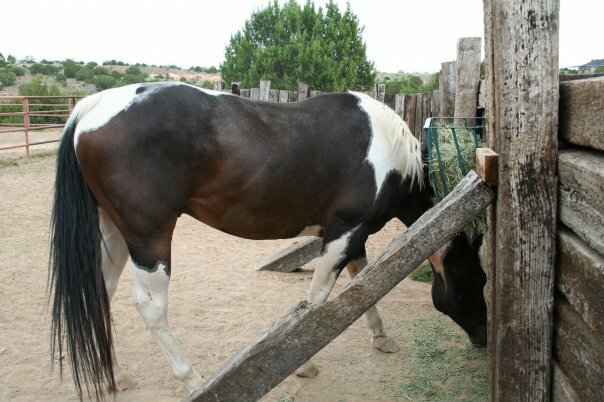 Three months ago, Cool, a horse I raised, died suddenly from acute colic. Cool was a friendly, inquisitive character. He investigated everything, knew when you forgot to shut a gate totally, knew how to open things, never missed anything that was occurring. Fun and funny and well loved. So well loved in fact that the photo on the back of On the Rim of Wonder is of me holding his bridle while my friend’s exchange student from Austria, Klara Kamper rides him. Apparently, I am not the only one who misses him. 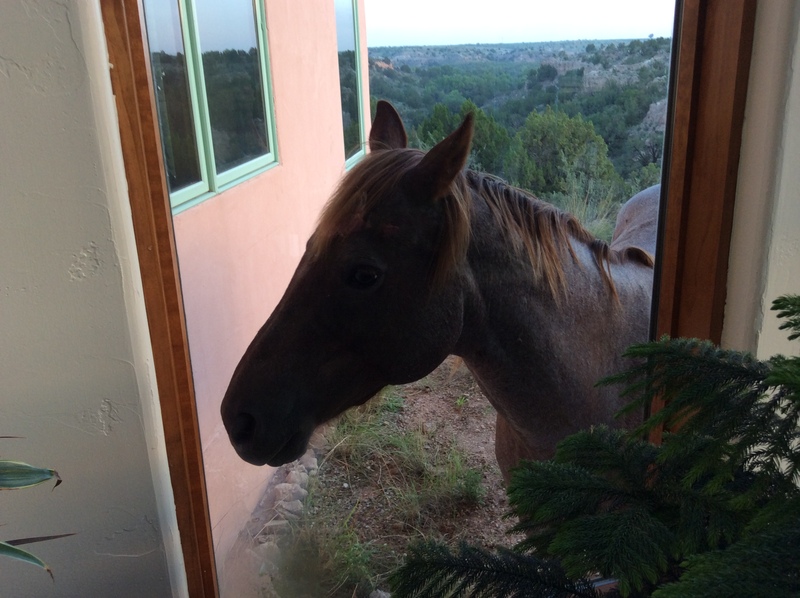 Rosie, my other horse, decided this past week that she needed to be as close to the house as possible so she could see me through the window. For the last several days, when I awaken, there she is complete with her nose prints on the window. This morning I decided this had to stop for several reasons, one of which is that she is trampling all the flowers and grasses I have tried to grow in this caliche area. It is also not easy to get her to leave. I have to hike around the house and drive her reluctant self out along the edge of the canyon. 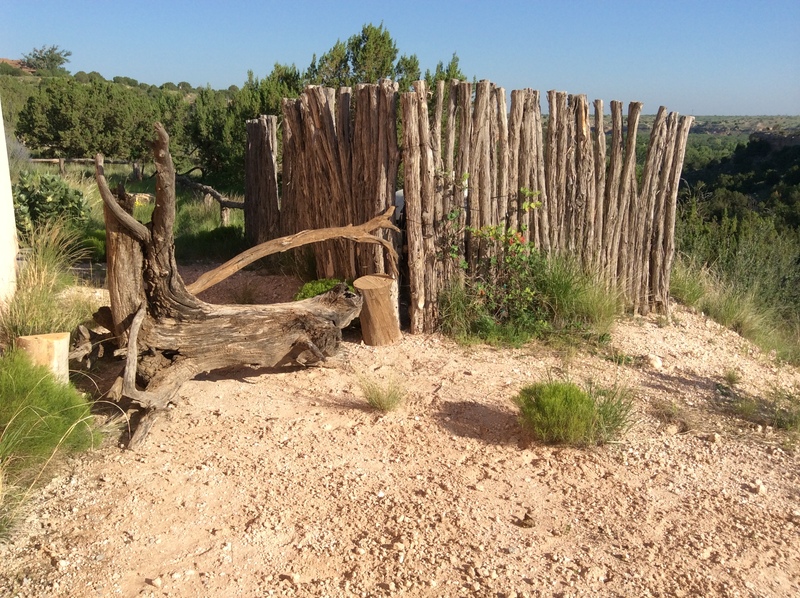 A fence around a propane tank covers part of the width between the house and canyon–the area through which she walks. About fifteen feet in front of it a large old log sat mostly for decorative purposes. It occurred to me that I could possibly move this back between the fence and house. It is so heavy that to do so I had to pick up one end and move it six inches then go to the other end and do the same. By doing this repeatedly, I did manage to move it. However, a small gap on either side still existed. Since horses can jump, she could jump the foot or so over it if determined. I found another dead piece of juniper to put across the top and two old log pieces to put at either end. Now I can only wait and see if this deters her. 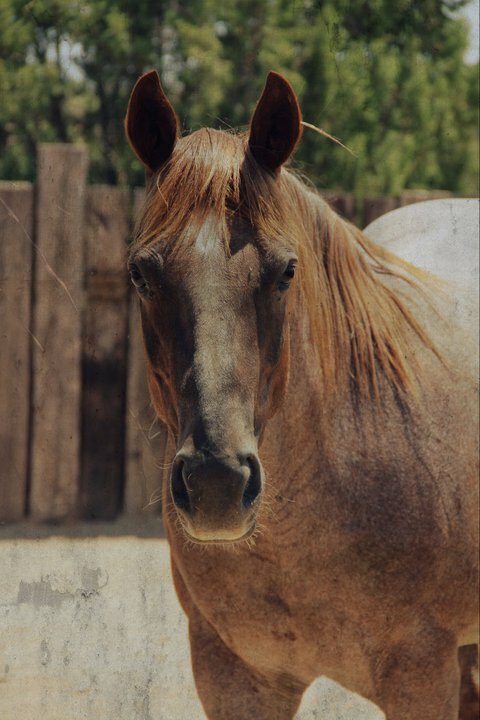 When I return from my trip to Africa, I think I must find another horse to keep her company. In the meantime, she must endure sadly. Here are some photos of both of them when Cool was still alive and well. While writing this, I heard neighing and checked to see. Poor, sad Rosie stood at the other end of the obstacles I set up. It was as if she were calling to me to please, please, please let her get back by the house. I ignored her pleas. Eventually she gave up and walked away. Now I am just hoping that she does not find the little walkway by the garage that goes to the front door, which I frequently leave open for the summer breeze. She would just walk into the house. 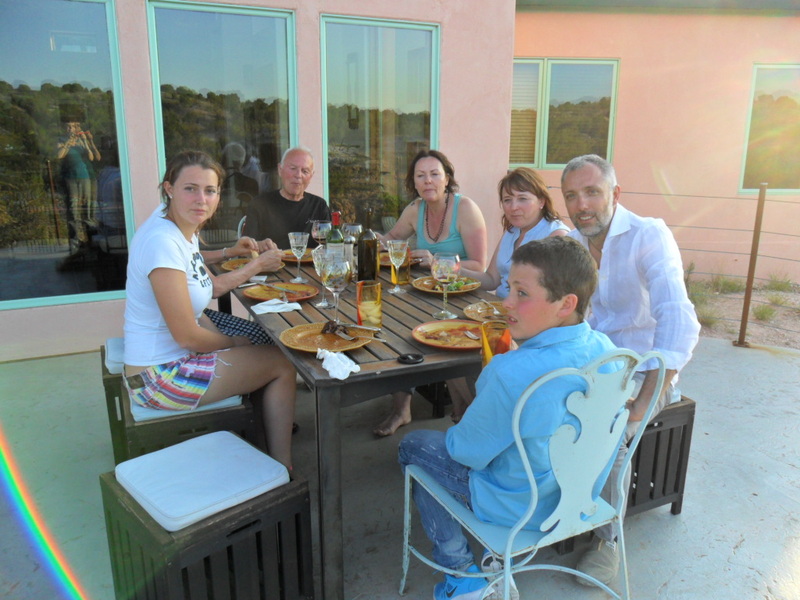 Yesterday evening, I felt honored to cook dinner for this wonderful family from the mountains of Italy. Lisa, the daughter, has been living with friends as an exchange student. 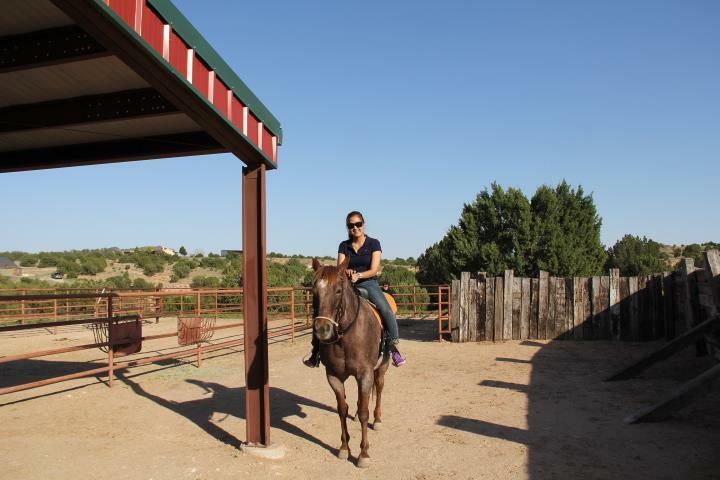 Lisa had been to my house several times with her host parents and ridden Rosie. This week her parents, grandparents on her mother’s side, and her younger brother came to see her high school graduation Friday evening. Last night they all came to my house. Lisa speaks fluent English, her parents and grandfather some, but her grandmother very little. They do understand Spanish so I spoke Spanish to her grandmother, some Spanish to everyone else, some English, and, of course, everyone spoke bits and pieces of Italian or all Italian. Grandfather Corrado smiled and laughed and hugged. When he was younger, he was ranked fifth in the world in cross country skiing. He spent much of his life, more than thirty years, in Germany making and selling ice cream. We did have ice cream for dessert–vanilla with Chambord on top. 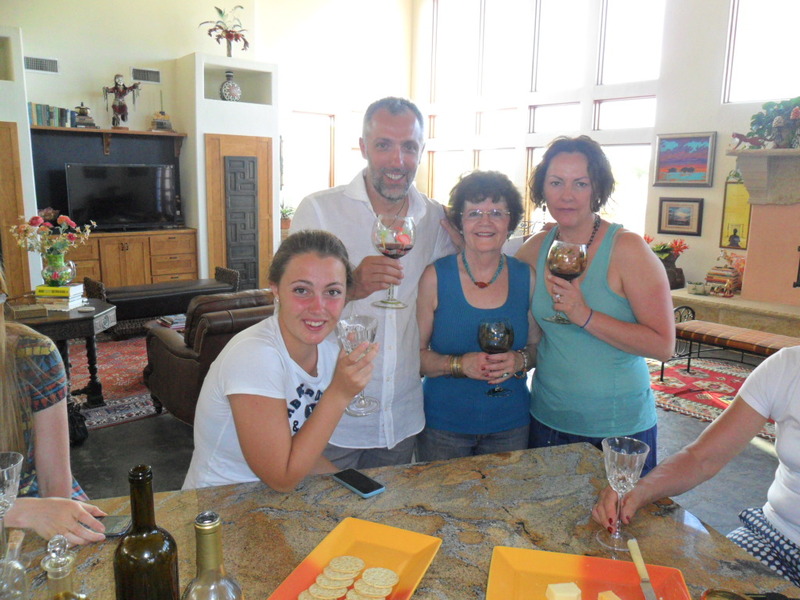 Corrado drinking sangiovese from a local winery, BarZ, with Jeannette, the host mom of Lisa. 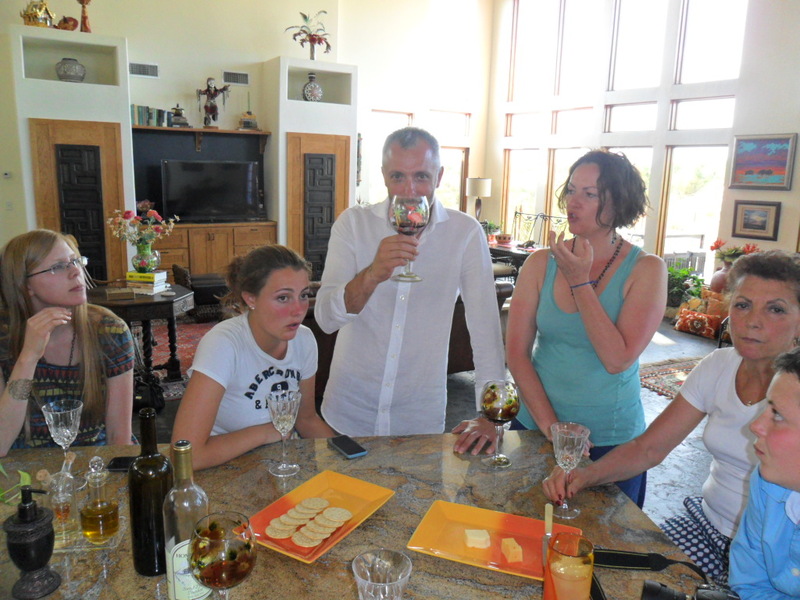 Later, we had another bottle of sangiovese from a different winery, DiVine Wine. 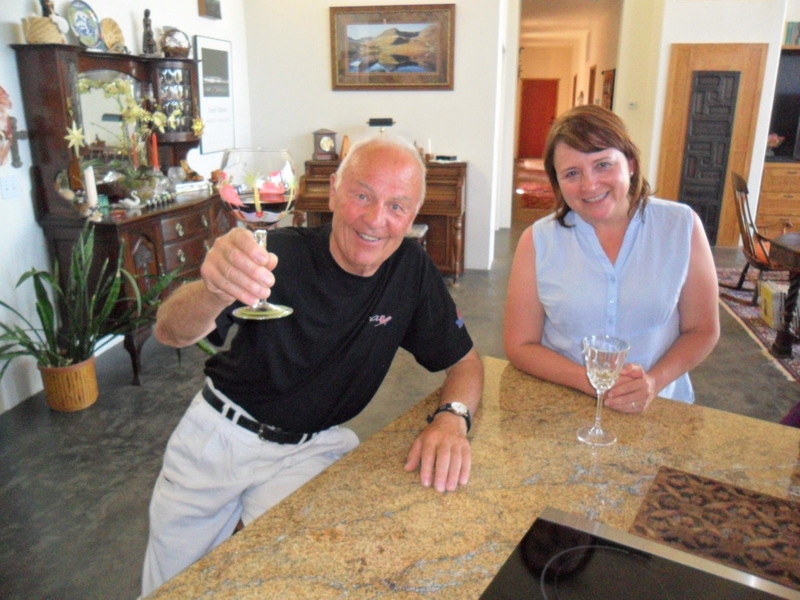 They explained they drink wine every day so they felt right at home at my house. Lisa, in the Abercrombe T-shirt with her dad, Benedetto, next to her. And yes, that is Corrado smiling down there on the end. 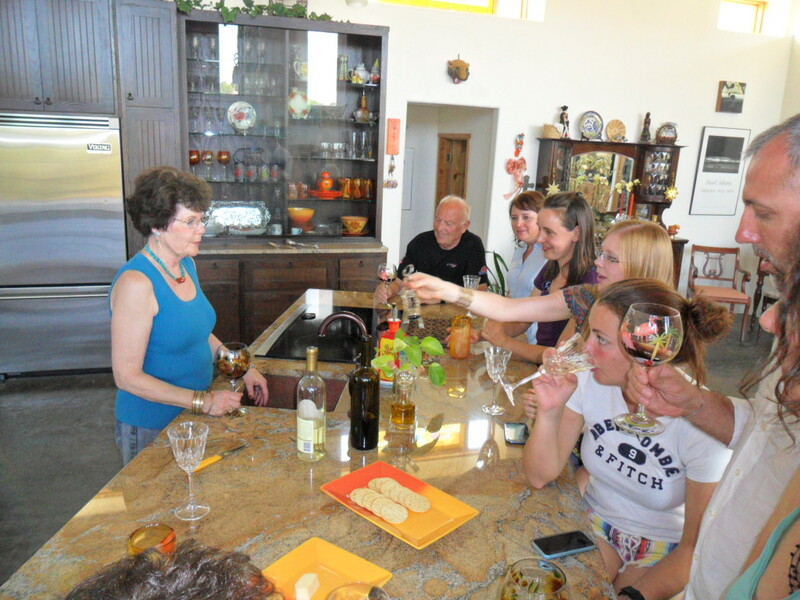 Benedetto in the white shirt claimed that the sangiovese here seemed stronger than at home. Claudia, Lisa’s Mom appears to be explaining something, but I do not recall what. Grandmother Angelina is on her right and younger brother Antonio at the far right edge. Everyone seems enthralled. Benedetto is an architect. From left to right, Lisa, Benedetto, me, and Claudia. They felt right at home with my dog Isabella; she has an Italian name. 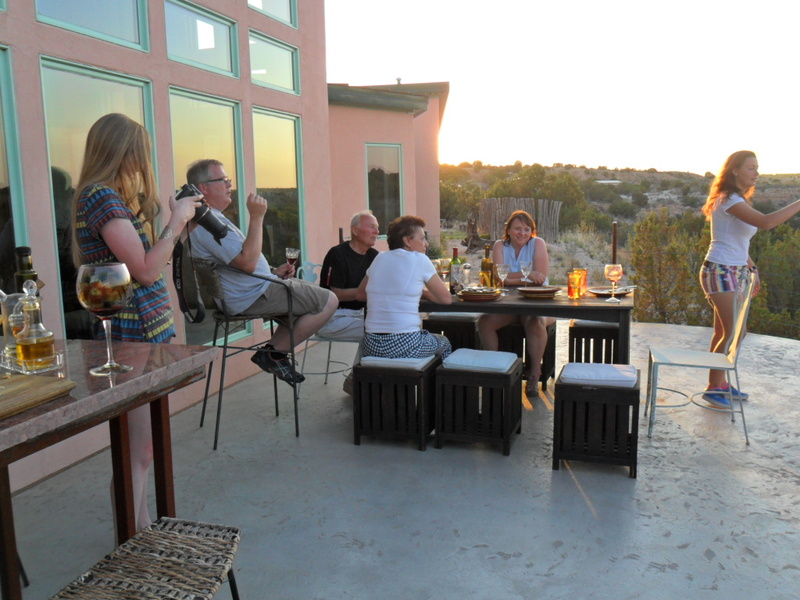 Everyone agreed to eat dinner on the patio–and you were thinking all we planned to do is drink wine. The menu: brisket, roasted vegetables (red and purple potatoes, brussel sprouts, Anaheim peppers, carrots, onions roasted with lots of olive oil, basil, oregano, and herbes de Provence), green salad and bread with chunks of garlic in it. 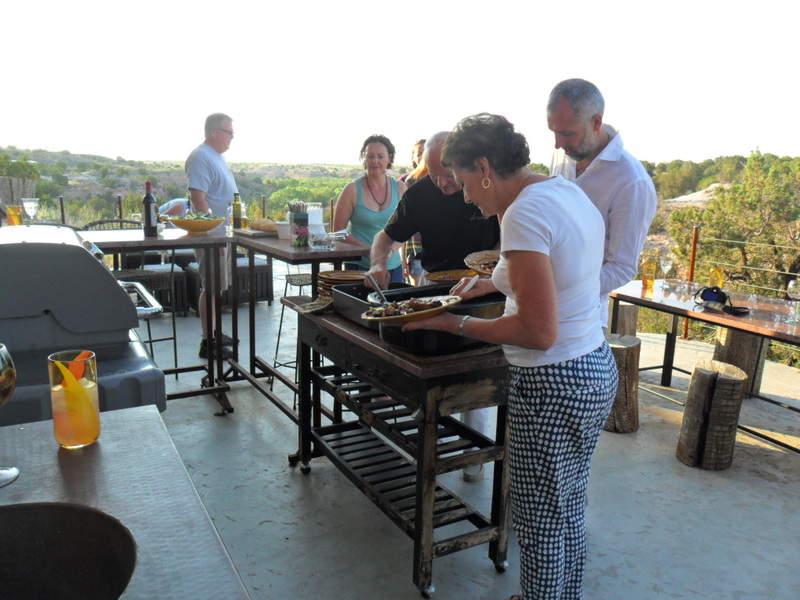 There is nothing better than eating and relaxing with friends and family. And what a beautiful family!! Laughter, hugs. How could one not enjoy all the hugs and kisses on both cheeks. 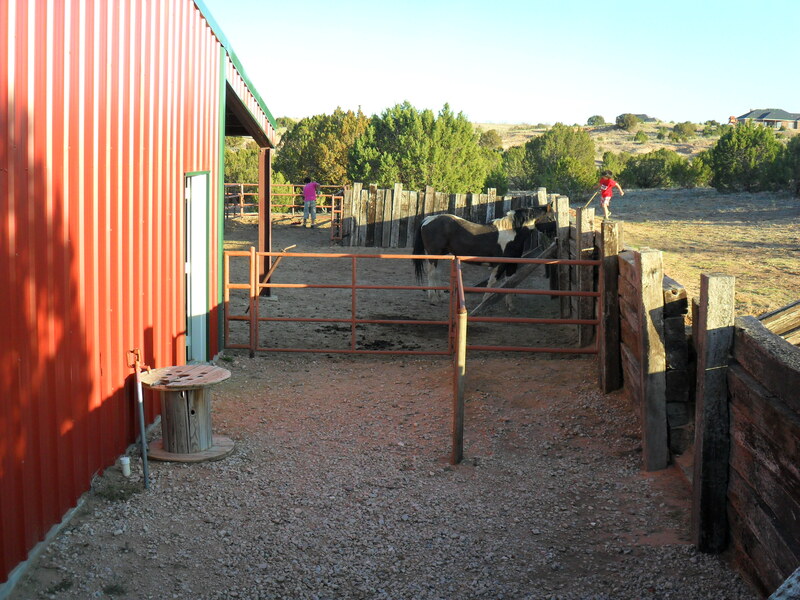 They had ridden horses in Palo Duro Canyon and hiked there earlier in the day, attended several graduation parties, and played volleyball. Antonio seemed very tired. He is 13. Richard, the host dad, relaxes in the bar stool while his daughter takes photos with his camera. A deer eventually showed up across the canyon. This lovely Italian family lives way in the north of Italy in Cortina d’Ampezzo. Claudia explained they work seven days a week during the seven month tourist season–it is skiing country, and then they like to travel. This evening as I write this they have headed to New York City by minivan via St. Louis and Falling Waters–Corrado really wants to see this Frank Lloyd Wright house. I feel so honored to have met them. Una bella famiglia–a beautiful family. This marks week one of my commitment to write for at least twenty minutes every day. A good way to “force” myself to do this is to blog daily. In this past week I have heard from new people and received more comments than usual. I had something already written out and then decided against posting it. Because I am at least one hour behind on what I planned to do when I arrived home from work, this blog may be a bunch of trivia, depending on what you consider trivia. 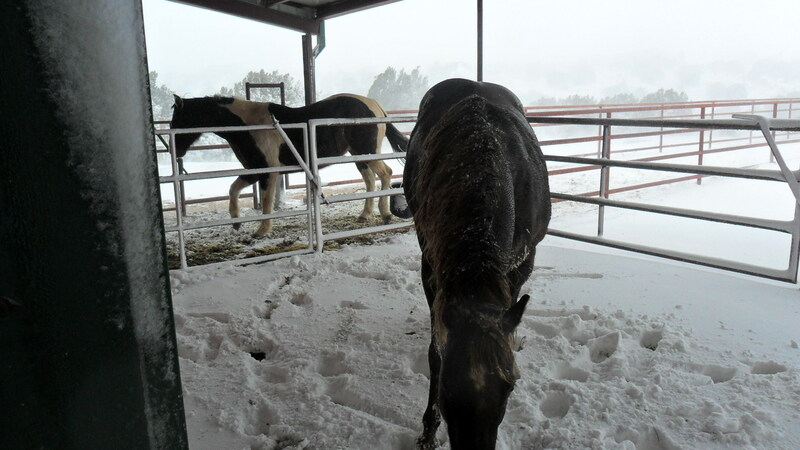 I had not planned on cleaning my barn in preparation for fifty 100 pound bales of hay, but when they told me they would deliver Wednesday instead of Friday, it changed this evening’s plans dramatically. I had to move the remaining hay from last November’s delivery to a different spot because I do not want “old” and “new” hay mixed. 100 pound bales do not weigh all that much less than I do so moving them is not all that easy. Once moved, I sweep the loose hay up, lay down pallets, and sweep up everything. I do not like hay to lay directly on the cement floor of the barn. All that took over an hour. Then it dawned on me that I should probably eat something. Time mandated simplicity so I made a salad. Suddenly it reminded me of salads Gaston used to make. Gaston lived with me for six months–a handsome exchange student from Argentina, who rode horses, played the piano while I cooked dinner, and then when I gave the word, made beautiful salads, kaleidoscopes of color, orange, red, green, yellow, purple. Tonight, in a rush, I finally managed to make a salad as beautiful as Gaston’s. In addition to his other assets, Gaston’s name is a song for the ears and the heart: Gaston Luis Zulaica del Sueldo. 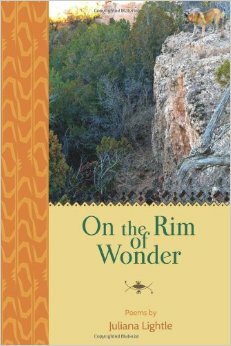 I love his name so much that it is the title of one of the poems in my new book of poetry, “On the Rim of Wonder”. His counselor at school here loved it so much that she insisted on practicing it over and over and over to get it right when she announced it at graduation. Salad eaten, once this post is complete, I must finish the baby blanket I promised today to deliver tomorrow. More than eight years ago, I taught freshmen English. One of my students, who has since gone to college, graduated, and now works for the school district where I work will soon be a father. His wife, through her work as a neonatal ICU nurse, became a good friend of my daughter’s. Their baby is due in a week or so. I am running out of time. I MUST finish this tonight. Since I have to get up at 5:30 to get to work on time–I work 25 miles from where I live–it would seem that since it is now 7:49, I had better quit writing this and get to work. Tomorrow I promise more exciting material. This prose poem recently appeared in the latest “Story Circle Journal”. They’re young; they’re handsome; they’re mine for six months. closed. Even the snow plows give up. We’re house and barn bound. Horses need food. 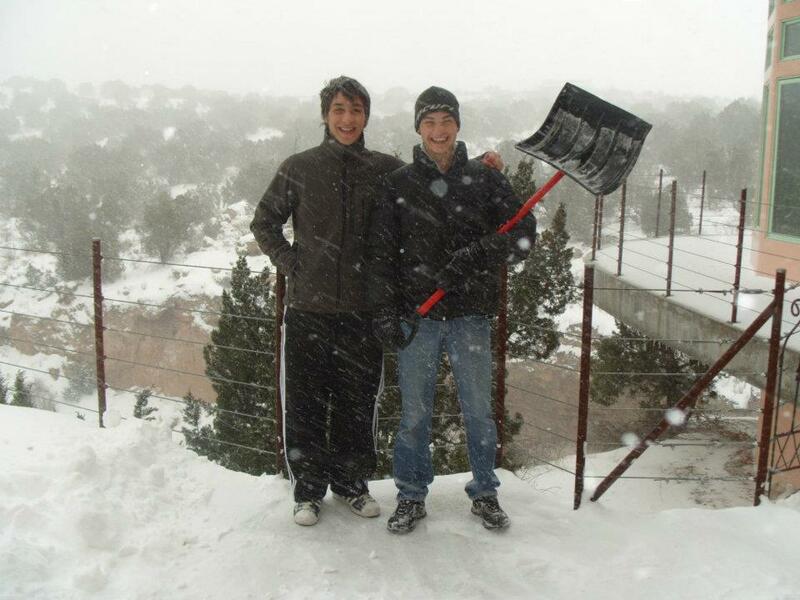 We all pitch in, climb through drifts, shovel. Schools never closed are closed; offices closed. No lights on the road. They shovel tracks for the truck all the way from the barn to the main road. I miss them, especially in winter. Gaston Luis Zulaica del Sueldo walks toward me after disembarking from the plane. Although I have never met him, I know exactly who he is. Tallish, thin body; long, handsome, light tan face; smiling, perfect teeth; arms open. A teenage Latin Lover, bouncing on the balls of his feet, rushing to me. Those arms wrap around and squeeze me tight. My new son has arrived from Argentina. Every night while I fix dinner, he sits at the brown Kanabe piano my parents gave me thirty years ago and plays and plays: Beethoven, the theme from Twilight, Chopin…I look up from chopping onions and see the short, dark ringlets on the back of his neck and watch his gliding, long-fingered hands. He plays until salad making time arrives. He tells me he makes salads for his grandmother back home. Now he makes them for us: layers of emerald lettuce, red peppers, black olives, orange carrots, green onions, a kaleidosope of appetizing color. Gaston Luis Zulaica del Sueldo. Note: One of the assignments in the prose poetry class was to write about a name, real or imagined. This one is real. Gaston lived with me a couple of years ago and I still keep in touch with him and his family. This recipe is posted as a tribute to Klara Kamper, from Austria. Klara is an exchange student and nearly every week she has come over to ride my horse, Rosie. After riding, I fix dinner. Of all the different dinners I have fixed, this is Klara’s favorite. Cover the bottom of a large skillet with olive oil. Saute the onions until done. Add chicken and more olive oil if necessary. With your fingers sprinkle herbs de provence over the onion/chicken mixture. 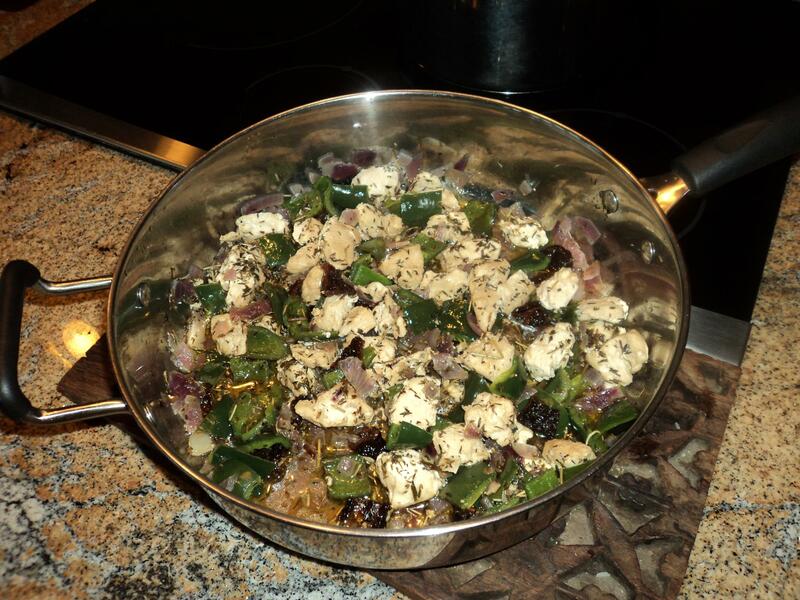 When the chicken is nearly done, add the poblano peppers and sun dried tomatoes. Saute until the poblano peppers are cooked but still a nice bright green. You may also add mushrooms if you like. Serve over your favorite pasta. My daughter does not like herbs de provence so when I cook this for her, I use a mixture of oregano, basil, and marjoram. I am very, very picky about pasta. My favorite is organic Montebello pasta produced by Monastero Di Montebello, Isola del Piano, Italy. I especially like the conchiglie. However, I use their spaghetti and other shapes as well. This is Rosie. She will really miss Klara who leaves for home on June 25. A friend joined us to see the horses and for dinner. Apparently, she took this photo just before I served dinner.